I have been living in this area of Southeast, Michigan all of my life. I have driven past Apple Annie’sÂ in Roseville, MI numerous times, way too many to count. I have always been curious about how their food was. Last night my family and I finally gave it a whirl. We try to be thrifty while dining out and we had a coupon from a local paper. I haveÂ always heard that they were famous for their soups and that was plenty enough to get me to try it out because I love having a nice cup of soup to go with my dinner. On their website, they mention that they were voted best soup in Michigan for two years in a row. That was a claim I was willing to find out for myself. We also stopped by Roger’s Bulk Candy & Ice-Cream after dinner. Read more to get the deets! The first thing you notice while coming inside the restaurant is the dessert cases. There were fresh baked cookies, brownies, and I even spied with my little eyes Sanders Bumpy Cake, which is one of my all-time favorite cakes. Apple Annie’s is not only a restaurant but a bakery as well. They offer up freshly baked fruit pies, deliciously appealing bakery desserts, and specialty loaves of bread. We sat down and looked over the menus. I sure made a great first impression for me. They specialize in traditional fare but also have some exciting items on the menu. I was really impressed with the soup list (as shown below). I had to inquire to the waitress about Kapusta and the Forest Gump Soup, since I had no idea what those were. Kapusta is a Polish soup with kielbasa and potatoes in it. The Forest Gump, which I should have know, had shrimp in it duh! Bubba Gump shrimp anyone?? I really was torn on what to order here because there were a lot of great options I could go with. I almost ordered one of the summer specials that was a pineapple half stuffed with salad and fruit. Gosh, that sounded amazing! I went back and forth in my mind and when the waitress finally showed up I told her that I was going to be brave and try out the Kapusta for the first time in my life. I figured that soup would pair well with the cabbage rolls so I ended up ordering that. I have not had stuffed cabbage in who knows how long? It’s really been that long! I love that dish but never cook it at home because I would be the only one here eating it, unfortunately. Joe ended up going with the Dinner Chicken Pot Pie. He was going to go with a regular ol’ cheeseburger and I talked him into that. He orders a cheeseburger pretty much everywhere we go, or fajitas. Chloe had a decent children’s menu and I was hoping she would order something a little healthier but she really wanted a cheeseburger and fries. I was fine with that. I received my soup and my eyes lit up. It looked so wonderful! I was excited to try out my kapusta for the first time and it did not disappoint. It was like a Polish explosion in my mouth. I really could have sat there and devoured a bowl of this soup. I see why they were voted for top soup in Michigan. I couldn’t think of a single thing that I did not enjoy about this soup. A big plus for me was there were many chunks of kielbasa and plenty of diced potatoes. It was a thick and hearty soup. Joe, on the other hand, had chicken noodle soup. I did not try it but he said it was a bit on the salty side. I think he is just really adjusted to the way I cook at home and I use a minimal amount of salt in my food. When we dine out nowadays, food often does come across heavy on the salt side. The soups came out with a basket of warm, freshly baked bread. I took a little taste but let me daughter have my dinner roll. She and Joe enjoyed the bread very much. So now for the dinners! In the photo below I showcase our two dinners: Dinner Chicken Pot Pie and the Cabbage Rolls dinner. Do I get a trophy or a badge? I did somehow manage to stuff three golabkis at Apple Annies, a pile of mashed potatoes, and some steamed carrots into my skinny frame! I was stuffed to the gills with food. We did not order dessert at Apple Annie’s but maybe next time! Overall, I was highly satisfied with my meal. Chloe was delighted with her meal. Joe did not particularly care for his pot pie. He said he would give Apple Annie’s another chance. I’m sure next time he will just be safe with his burger. For myself, I will definitely be exploring other items on the menu. Apple Annie’s was delicious! Delcious! If you would like to learn more about Apple Annie’s check out their website HERE. There is a Roseville location and a Clinton Township location for your convenience. You can view the entire menu online so you will have an idea on what you might order when you visit. The menu is quite big and has so many great items on it, it is hard to narrow it down to one choice. 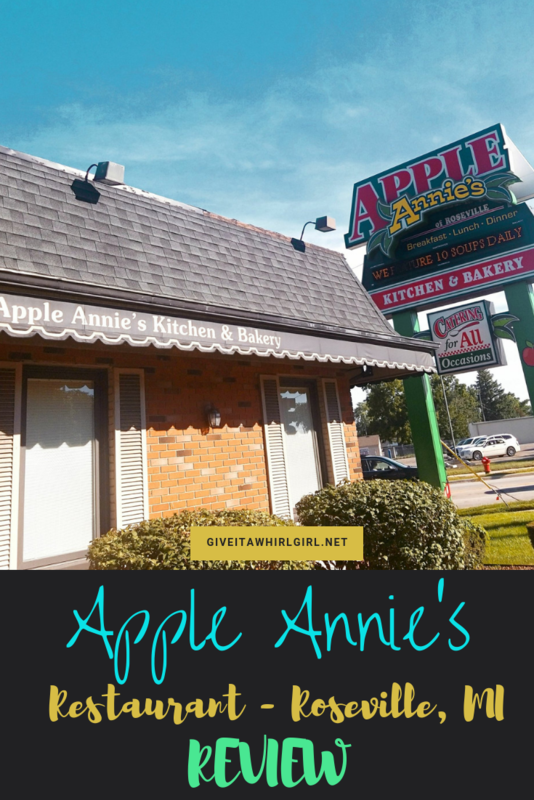 Hope you enjoy your experience at Apple Annie’s as much as I did! Next stop was dessert. We have been overindulging a bit in the ice-cream as of lately. I admit that I have an ice-cream problem… a real true addiction. I could eat every single day in the summer. We ended up visiting Roger’s Bulk Candy & Ice-Cream in Eastpointe, MI again. Our last banana split there was totally epic. You can read more about my first experience at Roger’s in THIS POST HERE. We decided we would share another banana-split once again for the three of us. We mixed it up just a bit this time around. We went with Blue Moon with chocolate on top, Amaretto Cherry with strawberries on top, and Superman with pineapple on top. Of course we also needed a heaping mountain of whipped cream and rainbow candy sprinkles. We also had to have our three maraschino cherries on top. I think every kid always gets a kick out of eating the cherries on top! We were met with service and a smile at Roger’s. The staff there is very friendly and always willing to help. The girl who waited on us was patient and created a gorgeous banana-split worthy of an Instagram post. Today is Saturday and I don’t have a clue what I am making for dinner tonight. Actually, I would rather go out on a date night since it is just me and hubby for two whole weeks! I might just maybe be making from-scratch pizza one more time for Joe and I. I ordered a Paleo Pizza Crust mix from Thrive Market and I am super curious about it. It could be something else other than pizza too because I got a great haul of Primal Kitchen dressings and marinades delivered yesterday. Decisions, decisions! I do have some great meals planned for the week. Chloe will be up-north in Oscoda, MI for two whole weeks so I will only be cooking for two for a while. Did you have a great meal this weekend, or do you have a fabulous meal planned for dinner tonight? Leave me a comment and let me know what is cooking. Comments are always welcomed and I enjoy getting them. To be quite honest, I get excited just to see that I have a comment to read and reply to! This entry was posted in Local Spots I Visited and tagged apple annie's, banana split, blue moon, candy shop, candy sprinkles, cherry amaretto, chicken pot pie, ice cream, kapusta, pizza, Polish food, primal kitchen, restaurant, restaurant review, rogers bulk candy and ice cream, stuffed cabbage, superman, thrive market. Bookmark the permalink. Apple Annies seems like a charming place, and the baked items look delicious. Ahhh I also have a weakness for ice cream. That Banana split does look amazing!